The EDC Tool Roll is a feature on Jerking the Trigger in which we profile various every day carry worthy tools. 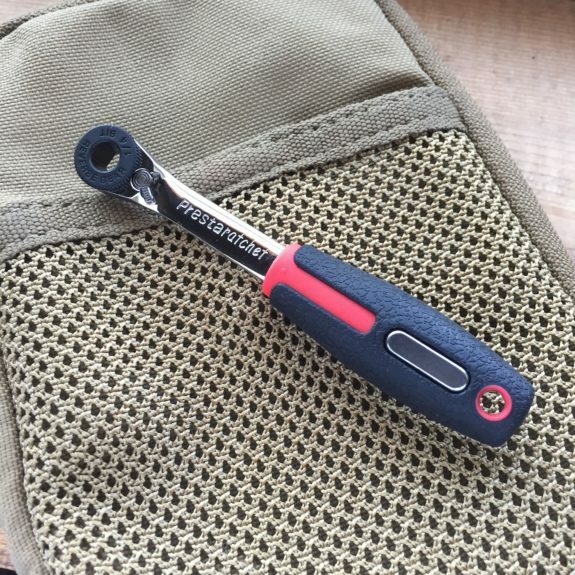 The tools shown aren’t multi-tools but rather real tools, that by virtue of their compact size, light weight, usefulness, or unique functionality, can find a place in any range kit, emergency kit, or every day carry bag. Feel free to comment on the tools that you carry so we can all learn! The discussion on these posts has been very valuable so far. The Prestaratchet 1/4″ Hex Bits Mini Ratchet is yet another tool that came to my attention because of a reader recommendation. Mark M. put this one on my radar and I am glad he did. Thank you Mark! The Prestaratchet is made by a bicycle accessory company called Prestacycle. In fact, they make a version of this tool with a handle that doubles as a tire lever which could be handy for the cyclists among us. However, the version being reviewed here today has a basic rubber handle with no tire wrench functionality. It comes as a bare tool with no bits included (though Prestacycle does sell nice bit sets with holders separately). My initial reaction when I first received the Prestaratchet was that it looked a lot my favorite VIM Tools Bit Ratchets. The head on those tools is very recognizable because it is the smallest I have seen. This makes the tool great for use in tight spots. On further inspection, it appears that the Prestaratchet is virtually identical to the VIM Tools HBR4. This is a good thing because of the head size which I have already mentioned and my very good experience with VIM Tools’ products. This tool works like any other similar ratcheting bit driver that we have already reviewed. It can accept standard 1/4″ hex shank bits or can be used as a socket wrench with the use of an adapter. This makes it extremely versatile for the EDCer or shooter. It is more compact than a traditional screwdriver and can be used with any bit or socket that you need. The mechanism is reversible via a small lever. There is a speed wheel for starting/finishing fasteners that don’t have enough friction to make use of the ratcheting mechanism. Bits are held captive and snap into the holder with authority. Unlike the two VIM Tools Bit Ratchets I have already reviewed, this one has a rubber handle. The handle adds very little bulk and is quite comfortable. It appears to be some kind of harder plastic with a pebbled TPE overmold. The TPE is not overly soft and has held up well to my use. I have found the padded handle to be particularly nice when my hands are cold, wet, or oily as it greatly improves grip. That is nice if you do a lot of work or shooting outdoors. We have now reviewed several of these VIM Tools mini ratchets (or similar) and it is difficult to say which of them I prefer. The Prestaratchet/HBR4 is definitely the easiest to use in conditions that compromise your grip. The HBR5 is like the most versatile of the bunch. The HBR3’s box end makes it nice in higher torque application like trying to break a stubborn fastener loose and its small overall size is nice for EDC. Pick the one that suits you best. Do you have bot ratchet that you prefer or another tool recommendation that fits The EDC Tool Roll? Tell us about it in the comments below or drop us a line on the Contact page. The above URLs may be affiliate links. Could you make a Tool Roll link or sub-page. I’m slowly buying a lot of the tools and sometimes it’s hard to go back and find your old posts. Like for instance the mini knipex cutting pliers, I can’t find the details of that post anymore???? Anyway it would be helpful. Oh my god I’m an idiot! I just realized that The EDC Tool Roll orange link is a continuous post of all the tools you’ve previously posted if you keep scrolling. Who’s a dummy? This Guy! Thanks for reading JTT Mick! 10% Off Your First Purcase at Ballistic Advantage - Use Code "SAVE10NOW"
10% Off Your First Purcase at Aero Precision - Use Code "SAVE10NOW"
The best selection of bags and cases, from such brands as Arc'teryx, Oakley, Crye and many more! © 2019 Jerking the Trigger. All Rights Reserved.